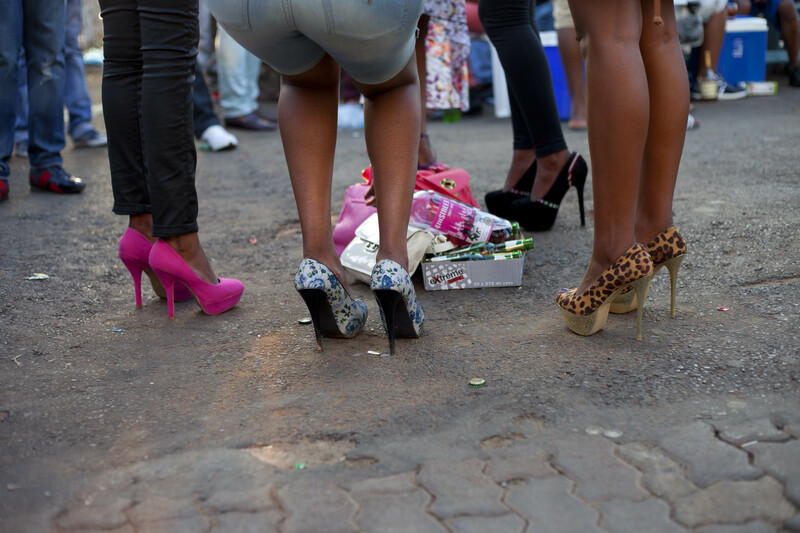 Muntu Vilakazi is an established photojournalist currently employed by City Press in Johannesburg. Today marks the opening of his first solo exhibition, which runs through March 16 at Goethe On Main in the trendy and controversial Maboneng Precinct. The show is titled “The Politics of Bling: An East Rand Culture Quest” and examines the flashy lifestyles of young people in the East Rand townships of Katlehong, Vosloorus, and Kwa-Thema (just east of Johannesburg) on the eve of South Africa’s twentieth year of democracy. All of the 21 photographs on display were taken between 2009 and 2013. Vilakazi has a wonderful eye for detail and the series shows scenes of people performing and showing off a level of decadence and consumption that is often at odds with the conditions of their surroundings. His images have a way of drawing out small facets – the design of a woman’s heels, the individual elements of a man’s outfit, the leather of a home-made matchbook holster – of each of the larger scenes he captures. Stilettos. A group of ladies identify a spot to lay their alcohol and stand. They surround their goods and enjoy the music. Hurricanes, Katlehong. February, 2013. Most of the shots were taken at local drifting events, street parties, or motorcycle rallies. According to Vilakazi, the thread connecting it all is the omnipresence of house music around which everyone gathers. The collection as a whole gives an intentionally superficial look at the extravagant social scenes of youth living amid rampant poverty. Red Dress. A lady displays her fashion sense in the form of an extreme hairstyle and dress sense. Many of these partygoers dress to the nines and make a bold statement. Hurricanes, Katlehong. September, 2012. In our conversation, Muntu Vilakazi was careful not to offer his own opinion on the culture; he was very emphatic about wanting people to come to their own conclusions. Born in Soweto, but raised in the East Rand, Vilakazi claimed he simply wanted to bring exposure to an area he has access to that is often overlooked. He saw his work as photojournalism first and art second, asserting that deep analysis of each image, while perfectly acceptable, was not necessarily the point. U Wish. A popular way of showing off is customizing your vehicles plates, as well as “pimping your ride”. Hurricanes, Katlehong. February, 2013. However, it seemed apparent that his role as the father of a young child influences his feelings about his subjects and their lifestyles. Indeed, the last photograph of the series is that of a group of young boys watching in awe as the older folks around them party, drift cars, and show off their bawdy consumption. While showing me this final picture, he talked extensively of having to be aware of one’s behavior in public, since there are always those who look up to and inevitably emulate such lifestyles. Donuts. 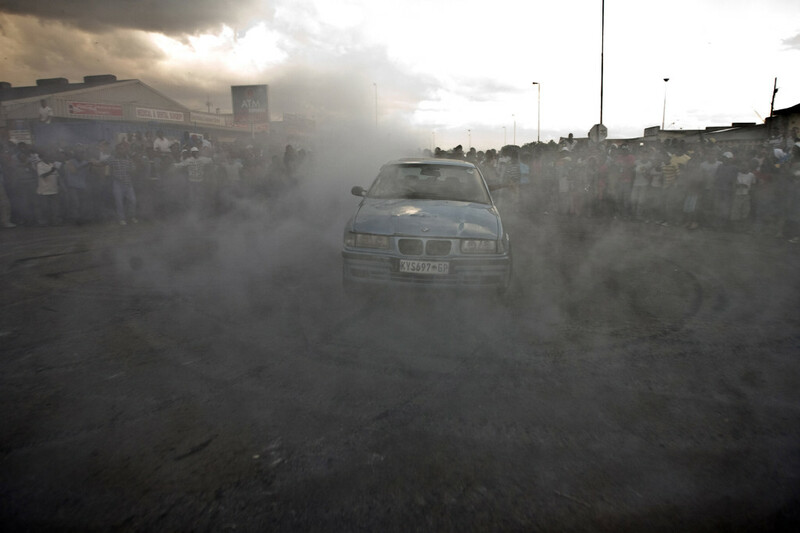 A BMW spins at a popular intersection in Vosloorus and quickly gathers a crowd from the sound of screeching tyres and a ravving engine. This form of show-off is illegal on public roads. Sotho Section, Vosloorus. November, 2009. Muntu Vilakazi himself has previously worked for The Sunday Times and Mail & Guardian. He has been mentored by the likes of Nadine Hutton and Greg Marinovich. All of this leaves him with some pretty solid credentials to begin with, but he has also undoubtedly managed to carve out his own niche and develop his own style. The exhibition opens today, Thursday (6:30 pm), and runs through March 16 at Goethe On Main, 245 Main Street, Maboneng Precinct, Johannesburg. Details here.